Heading into a cold spell after today so I am thinking of warmer days. This was a lovely day back in September when the Painted Ladies were visiting in large numbers and it was kind of magical to walk by them and have them all fluttering around. 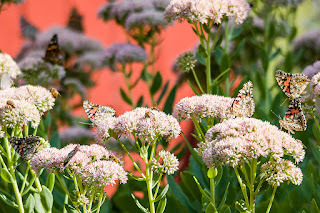 They were really enjoying my Autumn Sedum in the garden.